Lumbar Vertebrae are stacked to form a continuous column in order from superior to inferior. Together they create the concave lumbar curvature in the lower back. The five vertebrae situated between the thoracic vertebrae and the sacral vertebrae in the spinal column. The lumbar vertebrae are represented by the symbols L1 through L5. These vertebrae carry all of the upper body’s weight while providing flexibility and movement to the trunk region. They also protect the delicate spinal cord and nerves within their vertebral canal. It helps support the weight of the body, and permit movement. The vertebrae support the body and provide the protective bony corridor through which the spinal cord passes. The 33 bones that make up the spine differ considerably in size and structure according to location. 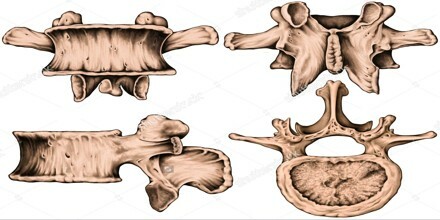 There are seven cervical (neck) vertebrae, 12 thoracic (high back), five lumbar (low back), five sacral (near the base of the spine), and four coccygeal. The five sacral vertebrae are fused to form the sacrum, and the four coccygeal vertebrae are fused to form the coccyx. Lumbar Vertebrae are the some of the largest and heaviest vertebrae in the spine, second in size only to the sacrum. A cylinder of bone known as the vertebral body makes up the majority of the lumbar vertebrae’s mass and bears most of the body’s weight. The vertebral foramen is a large, triangular opening in the center of the vertebra that provides space for the spinal cord, cauda equina, and meninges as they pass through the lower back. Lumbar Vertebrae are located at the bottom section of the vertebral column, inferior to the rib cage and superior to the pelvis and sacrum. Unlike the cervical vertebrae in the neck, the lumbar vertebrae lack the transverse foramina in the transverse processes, and also lack facets to either side of the body. 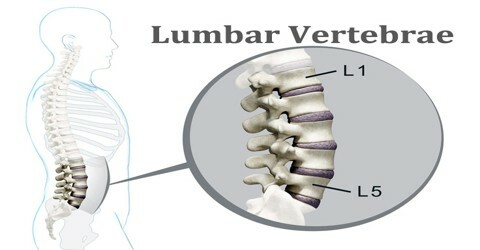 There are 5 lumbar vertebrae (denoted as L1-L5) found in adult humans, and they are situated beneath the thoracic vertebrae, being largest in size of all the vertebrae since the lumbar vertebrae must be able to support the weight of the body when a person is standing due to the effects of gravity. 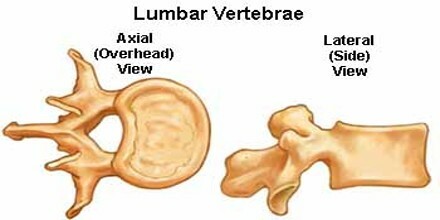 The first lumbar vertebra is level with the anterior end of the ninth rib. This level is also called the important transpyloric plane, since the pylorus of the stomach is at this level. Other important structures are also located at this level, they include; fundus of the gall bladder, celiac trunk, superior mesenteric artery, termination of spinal cord, beginning of fillum terminalis, renal vessels, middle suprarenal arteries, and hila of kidneys. Vertebral or spinal foramen (Foramen vertebrale) is a large, triangular-shape opening located posterior to the body. The spinal cord and several descending spinal nerves pass through the foramen. Pedicles of the vertebral arch (Pediculus arcus vertebrae) are posterior extension from the lateral sides of the body. 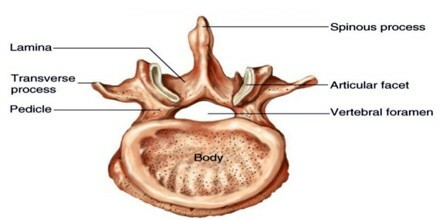 The two pedicles form the base of the vertebral arch. The laminae are broad, short, and strong. They form the posterior portion of the vertebral arch. In the upper lumbar region the lamina are taller than wide but in the lower lumbar vertebra the lamina are wider than tall. The lamina connects the spinous process to the pedicles. Laminae of the vertebral arch (Lamina archus vertebrae) are plates of bone that extends from the pedicles. The left and right laminae and spinal process form the dorsal portion of the vertebral arch. Three portions or tubercles can be noticed in a transverse process of a lower lumbar vertebrae: the lateral or costiform process, the mammillary process, and the accessory process. The costiform is lateral, the mammillary is superior (cranial), and the accessory is inferior (caudal). The mammillary is connected in the lumbar region with the back part of the superior articular process. The accessory process is situated at the back part of the base of the transverse process. The tallest and thickest costiform process is usually that of L5. Reference: kenhub.com, getbodysmart.com, innerbody.com, wikipedia.